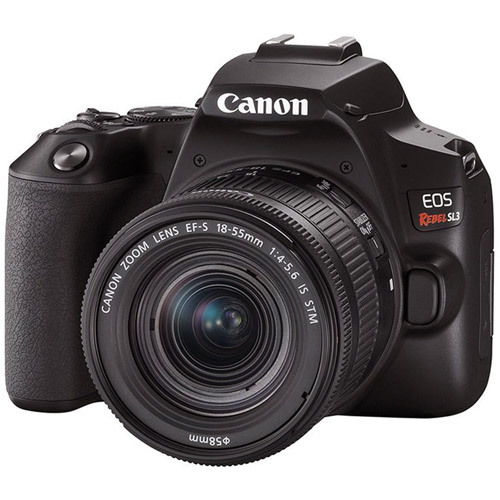 Whether you're a first time SLR user, an aspiring photo enthusiast, or someone looking to capture those amazing family moments, the Canon EOS Rebel SL3 can be the perfect companion. 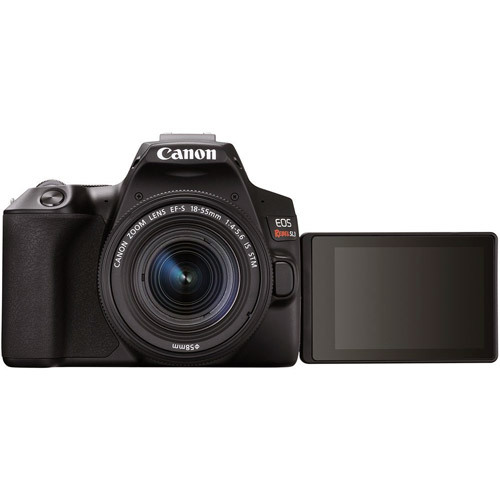 It's the smallest and lightest EOS DSLR camera to date*, and is equipped with 4K recording capability, Canon's Dual Pixel CMOS AF, and a vari-angle LCD for selfies and fun angles. 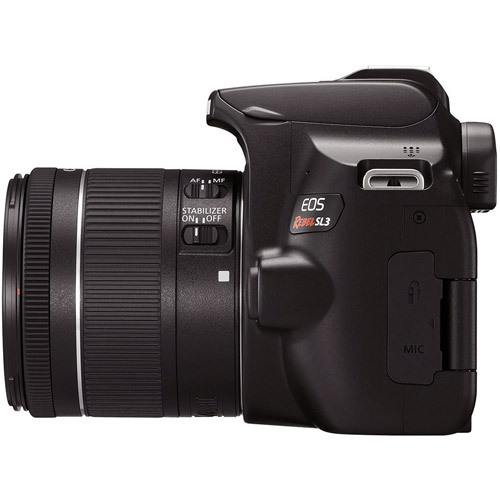 Its 24.1 Megapixel (APS-C) CMOS Sensor combines with the powerful DIGIC 8 Processor for amazing performance and results, and the EOS Rebel SL3 even lets you channel your creativity with options like 4K Time-lapse movies and Creative Assist. Wherever you are and wherever you go, the EOS Rebel SL3 camera makes it simple to capture stunning photos and videos to view and share. The EOS Rebel SL3 lets you shoot with Dual Pixel CMOS AF for fast, accurate autofocus that helps you get the photo you want right as the moment happens. The EOS Rebel SL3 camera features an expansive focus area of approx. 88% horizontal and 100% vertical^ when working with select compatible EF lenses. The Eye Detection AF analyzes the image and automatically determines where to focus based on your subject's eyes, helping you capture a treasured headshot or a once-in-a-lifetime moment with your best friend in sharp detail. Capture 4K videos at a frame rate of up to 24p for high definition, cinematic results. Recording at almost four times the resolution of Full HD, you can see your subject in stunning clarity. Beautiful time-lapse videos can also be created in 4K simply and easily with the dedicated Time-lapse Movie mode. You can also harness the power of 4K frame cropping^ to extract still images from your video recordings. All of this is possible in-camera without the need for additional software. 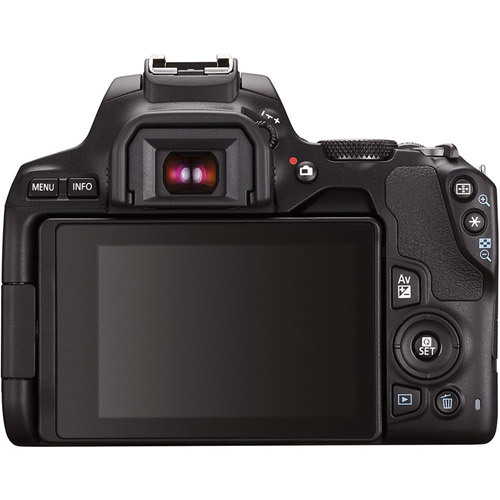 The EOS Rebel SL3 camera features a 3.0-inch Vari-angle Touch Screen LCD that can be ideal for composing and reviewing your photos. Tap the screen during Live View while taking photos or videos and thanks to Dual Pixel CMOS AF, the EOS Rebel SL3 will quickly lock focus to that location in the image. Touch gestures can be used for zooming in or swiping through images after you've taken them, and menu and quick control settings can be accessed quickly and easily. In addition, the Vari-angle Touch Screen LCD lets users capture high-quality selfie shots with ease. Built-in Wi-Fi & Bluetooth Technology with Auto Image Transfer. 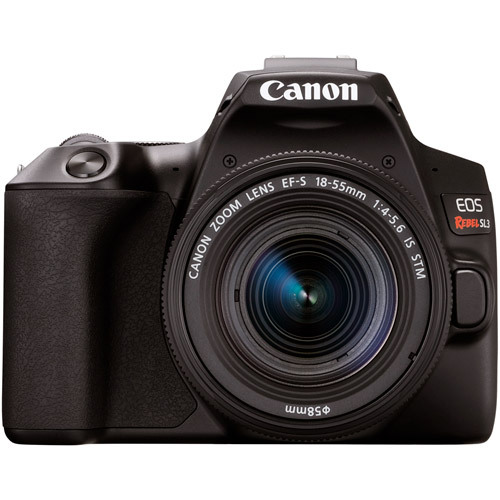 The EOS Rebel SL3 camera is designed to make connecting to a Wi-Fi®** network fast and easy. It can exchange data with other Wi-Fi® connected compatible Canon cameras, and transfer files directly to a compatible smart device using the Camera Connect app. The Wi-Fi® capability lets you share and upload directly to various web services like CANON iMAGE GATEWAY^, Facebook® and YouTube® as well as print directly to compatible wireless Canon printers. Bluetooth pairing helps you connect the camera to compatible smart devices using the free Canon Camera Connect app*. To customize the Bluetooth® function, simply click on the DISP button located on the top of the camera. In addition, Bluetooth® lets you connect to the optional Wireless Remote Control BR-E1 for remote shooting as well as pick up GPS shooting location data from the user's compatible smartphone. 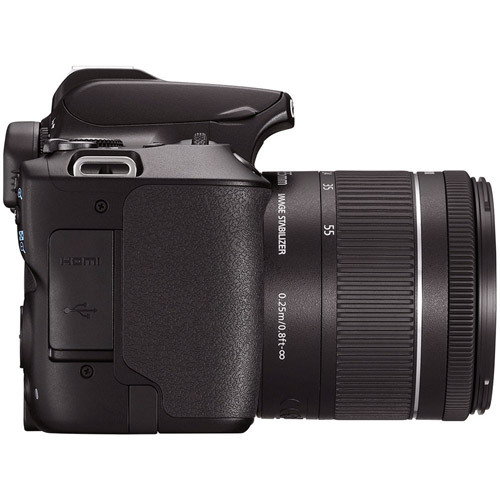 To help you frame your ideal shot, the Canon EOS Rebel SL3 camera incorporates a fully featured optical viewfinder with a wide-area, 9-point AF system that is designed to achieve sharp focus in an instant. This sophisticated AF system makes it easy to capture the action, no matter where the subject moves - even in bright light situations. 63-zone evaluative metering helps the EOS Rebel SL3 achieve optimal exposure with a diverse array of subjects and lighting conditions. Making it simple to change camera settings and see the results in real time, the Canon EOS Rebel SL3's built-in Creative Assist feature helps you find just the right look to match the emotion or tone of the image. With effects such as brightness, contrast and saturation easily found on one menu, the EOS Rebel SL3 is a convenient tool for getting great looks and experimenting with different styles. With its convenient Feature Assistant function, the EOS Rebel SL3 camera helps users take advantage of its advanced features and create impressive photos with ease. By explaining and illustrating the camera's shooting modes and their effects with sample photos of each mode, the Feature Assistant encourages experimentation and provides guidance for creating amazing photographs. The EOS Rebel SL3 features a mode dial on the top of the camera to provide quick and easy access to multiple shooting mode functions. Each mode displays an explanation and example to understand the meaning of that specific style - making this camera easy to use. There's even a Smooth Skin mode that offers five levels of skin smoothing to make the skin appear soft. • Self-cleaning activated automatically (taking approx. 2 sec.) when power is turned on or off. Manual operation also possible (taking approx. 8 sec.). Multiple aspect ratios (1:1, 4:3, and 16:9) can be specified in Live View Shooting. Values for Recording Pixels are rounded off to the nearest 100,000th. recorded image in the card. Simultaneous recording of any combination of RAW/C-RAW and JPEG image-recording quality is supported. filters> mode, and [Standard] will be set for other modes. Spot metering circle, AF point activation indicator, AF point, ISO speed indicator, Focus indicator, Maximum burst, ISO speed, Highlight tone priority, Exposure level indicator, Exposure compensation amount, AEB range, Red-eye reduction lamp ON, Exposure compensation, Aperture, Shutter speed, Bulb exposure, FE lock, Busy, Built-in flash recharging, No card warning, Card error, Card full warning, Error code, Flash exposure compensation, High-speed sync, FE lock / FEB in-progress, Flash-ready, Improper FE lock warning, AE lock, AEB in-progress, Warning icon. Provided with customized DISP button settings. Other AF points is vertical line-sensitive or horizontal line-sensitive AF supporting f/5.6. When Highlight tone priority is set to [Enable] or [Enhanced], minimun ISO speed is ISO 200. Basic Zone: 1/4000 to 1 sec. Time lag with the aperture stopped down by 3 stops or less from the open aperture. Release time lag will become longer for Live View shooting, Silent single shooting or Silent continuous shooting. The actual setting options will differ depending on the Speedlite used. Maximum continuous shooting speed with 1/500 sec. or faster shutter speed, EF 50mm f/1.8 STM lens, maximum aperture (varies depending on the lens), with a fully-charged Battery Pack LP-E17 and at room temperature (73Â°F/23Â°C). Creative Zone supported, Basic Zone not supported. Compatible with Wireless Remote Controller BR-E1. Countdown is shown on the screen. Incompatible with accessories using the infrared transmission system as Remote Controller RC-6. * When recording 4K movies or 4K Time-lapse movies. AE lock possible. The metering timer setting can be changed. * The image is cropped around the center of the image sensor. RAW/C-RAW images and movies cannot be specified for printing. Power turns off after the set time (10/30* or 30 sec., 1, 2, 4, 8 or 15 min.) of non-operation elapses.